As a member of BVKN, you will have the opportunity to work side-by-side with some of the world’s leaders in power, water, oil &gas engineering. Black & Veatch was founded in 1915 as a two-person partnership between former University of Kansas School of Engineering graduates Ernest Bateman (E.B.) Black and Nathan Thomas (N.T.) Veatch. The company began with 12 employees and an office in Kansas City, Missouri. It landed two large contracts, one in power and one in water, in its first year. The company’s strong ties with government work began in 1917, as the United States Government War Department asked Black & Veatch to supervise construction of military training camps during World War I. In the early years, the company mostly focused on water and power projects throughout the Midwest. In 1928, Black & Veatch designed and constructed 250 miles of roadways for Jackson County, Missouri. During that time, N.T. Veatch formed a strong friendship with Harry Truman that lasted through Truman’s presidency. Following World War II, Black & Veatch became involved with the work at the United States Atomic Energy Commission at Los Alamos, New Mexico. After E.B. Black passed away in 1949, Veatch directed the company and in 1956 formed a general partnership with 29 engineers. Black & Veatch later opened its first branch offices outside of Kansas City – locations in Orlando, Florida, and Denver, Colorado. In the early 1960s, the company made a move into international markets. Black & Veatch won a contract to produce a 60-megawatt power generating unit for Yanhee Electricity Authority, now known as EGAT, the Electricity Generating Authority of Thailand. Before Veatch retired from the company in 1973, he saw the company grow to more than 1,200 professionals, with projects spanning the globe. He was succeeded by managing partner Thomas B. (Tom) Robinson, who led Black & Veatch for 10 years and retired in 1982. His brother, John H. (Jack) Robinson, followed him as managing partner and guided the company for the next decade. Black & Veatch expanded dramatically in the United States between 1977 and 1984, opening 11 regional offices. The company also began a series of mergers and acquisitions starting in the late 1970s, acquiring Trotter-Yoder & Associates, Southern Science Applications, Inc. and Moore, Gardner & Associates. In 1985, the company acquired The Pritchard Corporation, which helped Black & Veatch enter the gas, oil and chemicals field and gain major energy companies as clients. Through acquisitions and organic growth, the company grew to 35 offices in the United States by 1990 and was also expanding in other parts of the world. In 1992, P.J. (Jim) Adam succeeded Jack Robinson as managing partner. He became the first Chairman of Black & Veatch in 1998 and served until his retirement in 1999. In 1995, Black & Veatch merged with Binnie & Partners of the UK, giving the company an opening in the UK, European and Asian water markets. The next year, Black & Veatch also acquired Paterson Candy Ltd., a UK-based water treatment process contractor. In 1999, the company changed its structure from general partnership to an employee-owned corporation. That change facilitated the company’s growth, as many of its clients were involved in multiple markets across the core sectors of energy, water, information and government. Len C. Rodman became the sixth leader in the company’s history in 1998 when he was named President and CEO, the title of Chairman was added on January 1, 2000. He guided the company through a series of acquisitions during his 15 years as CEO. In 2005, the company made three acquisitions – R.J. Rudden Associates, Lukens Energy Group and Fortegra – doubling the size of its management consulting business. Black & Veatch also made major expansion efforts with offices in Pune, India, and Beijing, China, and targeted new markets in Russia, China and the Middle East. The company was involved with reconstruction work in Iraq and helped with the recovery efforts of hurricanes Katrina and Rita in the United States in 2005. The company acquired the water business of MJ Gleeson in 2006, more than doubling the size of Black & Veatch’s UK water operations and further strengthening its construction expertise. In addition, the acquisition enabled the company to provide added project delivery capabilities to its clients. In 2007, the acquisition of Richard Connor Riley & Associates enabled Black & Veatch’s telecommunications business to grow exponentially to its industry leadership position in digital infrastructure. In 2009, Black & Veatch acquired Ariston Consulting & Technologies, a software systems integrator. The next year, Black & Veatch purchased Enspiria Solutions, helping to grow its position in the smart grid market. In 2011, the company fortified its position in the construction industry by creating a group of 1,300 construction, construction management and procurement professionals. That year, the group delivered $1.24 billion in construction and procurement work. The year 2013 was a time of transition for the company. With the announced retirement of Len Rodman, Steve Edwards was named Chief Operating Officer in April 2013 in a transition role before becoming Chairman and CEO on November 27, 2013. In 2013, Black & Veatch began working with Tesla Motors to support design and construction of its Supercharger network across North America. This system grew to be the largest contiguous network of electric vehicle charging stations in the world. The relationship with Tesla Motors expanded to include engineering, procurement and construction (EPC) services for stationary storage projects as well. Beginning in 2014, Black & Veatch provided EPC services for hydrogen fueling station networks for other clients, including 19 stations in California and 12 in the Northeast. In 2015, the company’s telecommunications business was ranked No. 1 for the sixth consecutive year by Engineering News-Record. The company became a leader in the floating liquefied natural gas (FLNG) market, using its patented PRICO® technology on two vessels, with a third project pending. The company became very active in the next generation of energy and water by developing its own microgrid at its World Headquarters, by teaming with Tesla to provide services surrounding Tesla Energy storage products and by partnering with Cisco for a smart city water initiative in Kansas City, Missouri. Today, the company continues to experience strong growth across its core markets. 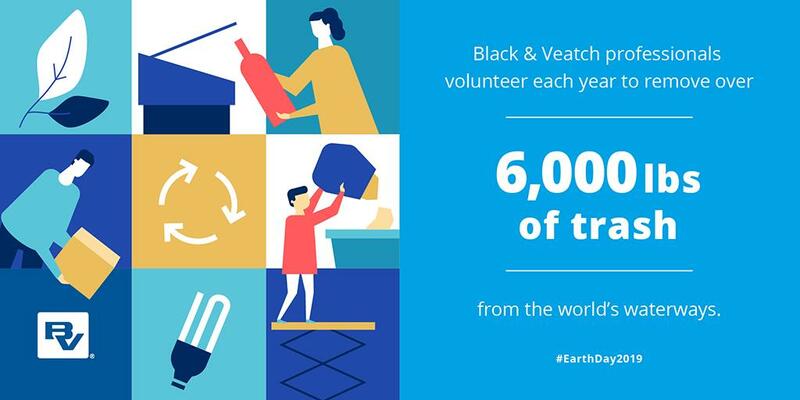 Black & Veatch currently has a global workforce of more than 10,000 working in over 100 offices worldwide with projects completed in more than 100 countries on six continents.